One thing that I enjoy a lot is capturing network traffic to subsequently try to figure out whether the captured traffic makes any sense -- you learn a lot that way. The following packet was shared with me by Timo Hilbrink during the 10th Slovenian IPv6 Summit. The quiz consists in explaining the packet trace bellow. So... can you explain what this packet trace is all about? The solution to this quiz boils down to explaining the two packets in question. 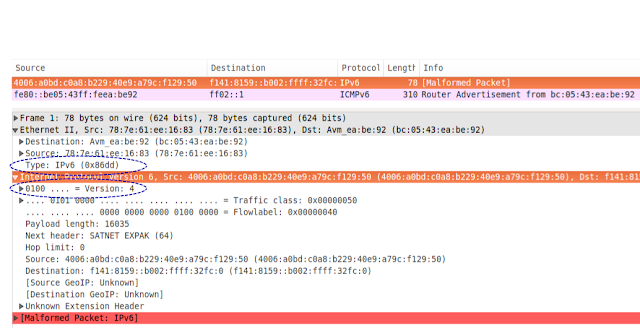 Upon first inspection, the first packet looks like a malformed/corrupted IPv6 packet: the packet is truncated, has an IPv6 Source Address that does not really belong to the local subnet, and even has an unknown upper protocol (Next Header=64). Quite surprisingly, the second 32-bits of the IPv6 Source Address are c0a8:b229 which, if converted to decimal on a byte-by-byte basis, results in 192.168.178.41. Looking at the packet decode, it's clear that while the Ethernet "Type" field is set to 0x86dd (IPv6), the IPv6 version field is actually set to version 4! What we infer from this packet, is that the sending system (Apple iOS 8.3) fails to properly set the Ethernet Type field (i.e., bug #1). Hence, this IPv4 packet is identified at layer-2 as an IPv4 packet, and hence parsed as an IPv4 packet. Now.. what about the second packet? How and why is it actually generated? First of all, it seems that the Fritz!Box CPE fails to perform a very simple sanity check: that the IP version field matches the protocol type identified by the Ethernet header. In this particular case, they do not patch, and the Fritz!Box CPE should have discarded the packet rather than process it (i.e., bug #2). That said, the Fritz!Box CPE seems to detect that the sending system is sending packets from an incorrect IPv6 prefix, and hence sends a Router Advertisement message with a Prefix Information Option (PIO) that advertises the corresponding prefix with a preferred lifetime of 0 -- in the hopes that this prefix is "disabled" in the sending system. This seems to be some sort of feature of the Fritz!Box CPE that aims to mitigate e.g. misconfigurations. Obviously, in this particular case the RA sent by the Fritz!Box CPE will be of no use, since the sending system is not really employing the 4006:a0bd:c0a8:b229/64 prefix -- it is simply sending IPv4 packets with an incorrect Ethernet Type (0x86DD rather than 0x800). That is, the first packet of the packet trace was really an IPv4-based TCP SYN packet, which obviously looked like a malformed IPv6 packet when "incorrectly" decoded as an IPv6 packet. Folks willing to take a closer look at the packet trace may find the corresponding pcap file here. The "corrected" pcap file (with the EtherType overwritten with 0x0800, such that the first packet is decoded as an IPv4 packet) can be found here. The IETF has published a new RFC by Fernando Gont: RFC7739. This RFC analyzes the security and privacy implications of predictable Fragment Identification (ID) values, and proposes a number of algorithms that can be employed to select Fragment ID values such that the aforementioned issues are mitigated. As a result of earlier (internet-draft) versions this document, a number of operating systems (ranging from Linux to Microsoft Windows) had patched their IPv6 implementations to mitigate the aforementioned issues. Recent discussions at the IETF suggest that the upcoming revision of the core IPv6 specification will remove the suggestion to employ a global counter for the generation of IPv6 Fragment IDs. Use of predictable identifiers have a long history in IETF protocols, as discussed in this recent internet-draft by Fernando Gont and Iván Arce.